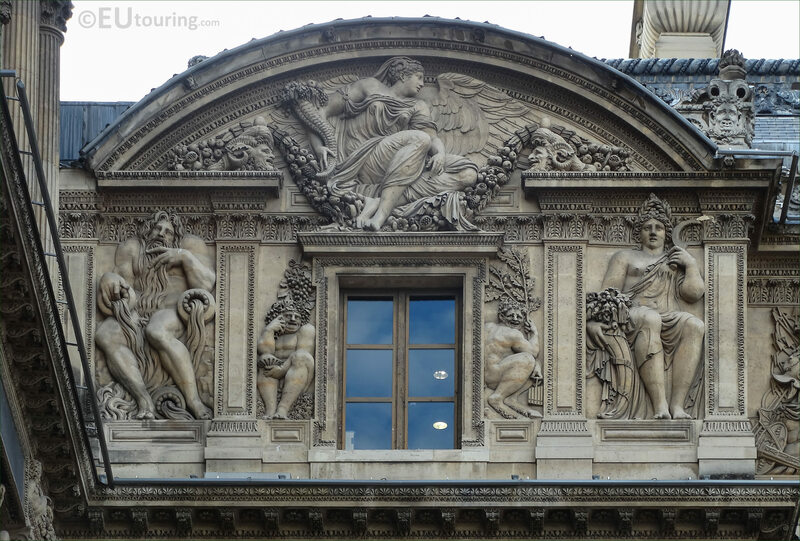 While we were in the Cour Carree of the Musee du Louvre in the 1st Arrondissement of Paris, we took these high definition photos showing a bas relief sculpture called Pan, which was sculpted by Jean Goujon. 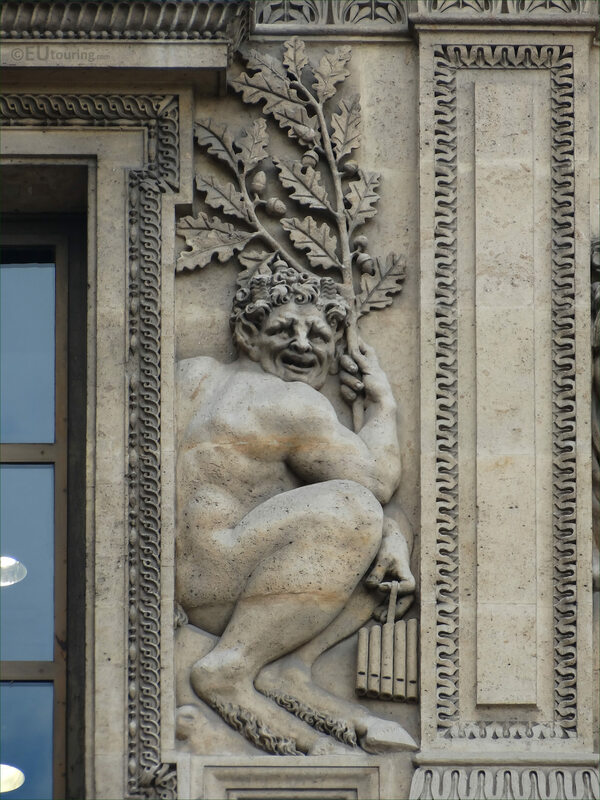 This first HD photo shows a bas relief, or low relief sculpture depicting Pan, the God of the wild or wilderness in Greek mythology, yet he is also associated with rustic music and in one story he was meant to have had a competition against Apollo, so hence why you can see a set of pipes, which are now referred to as pan pipes. Also, you can see that Pan has been depicted with his legs and feet as a goat, which is how he was portrayed in mythology, with Faunus being the equivalent in Roman mythology, and according to another story, his shout when disturbed in his secluded plate, has become the word panic, relating to when someone is panicking in a lonely or isolated place. Yet this photograph shows the entire top left hand section of the Aile Lescot, which can be seen from the courtyard of The Louvre called the Cour Carree, and it was Jean Goujon who sculpted all of these back in the mid 1500s, when this wing of the Palais du Louvre was constructed as an extension to the royal palace. And very little is known about Jean Goujon, although he was document on working on the cathedral at Rouen before going to Paris and working on the Eglise Saint-Germain l'Auxerrois prior to The Louvre, yet he left a legacy with his decorative art works on chateaux and churches before leaving France in 1562 to avoid the Wars of Religion.